Love this gorgeous little dressing. It goes very well with the mild lettuce growing in my garden. Plus, vidalias are hard to come by later in the year. Better enjoy them now. Soon they will be gone. 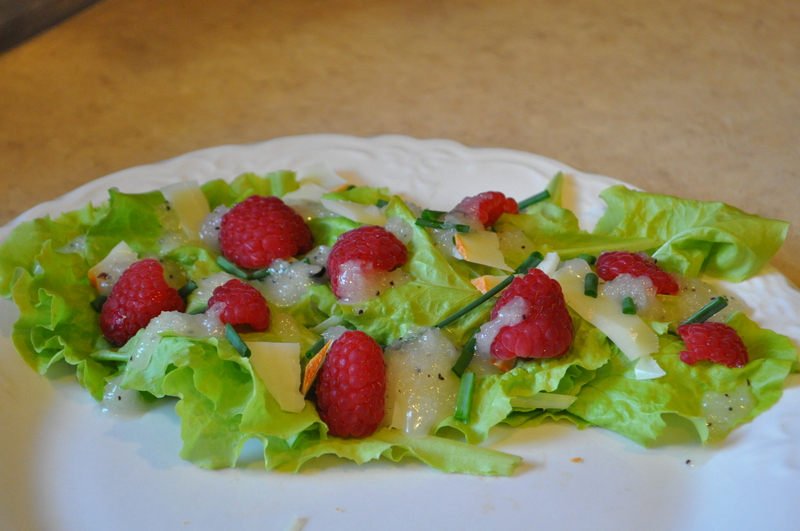 The salad below is Black Seeded Simpson Lettuce, Raspberries, Goat Cheese, Chives, and Sweet Vidalia Onion Dressing. Slice 1/2 inch off both ends of onion. Pierce onion skin in several places with a sharp knife. Place onion in microwave-proof bowl. Add a tablespoon of water and microwave, covered, on HIGH power until soft, about 3 to 4 minutes. Set aside to cool. When cooled, peel and place in food processor. Puree until smooth. Add oil, vinegar, sugar, mustard, garlic powder, celery seed, salt and pepper and process until smooth. Chill. Makes about 1 1/2 cups. Whisk together the above ingredients. Chill before serving. Makes about 1/2 cup of dressing. 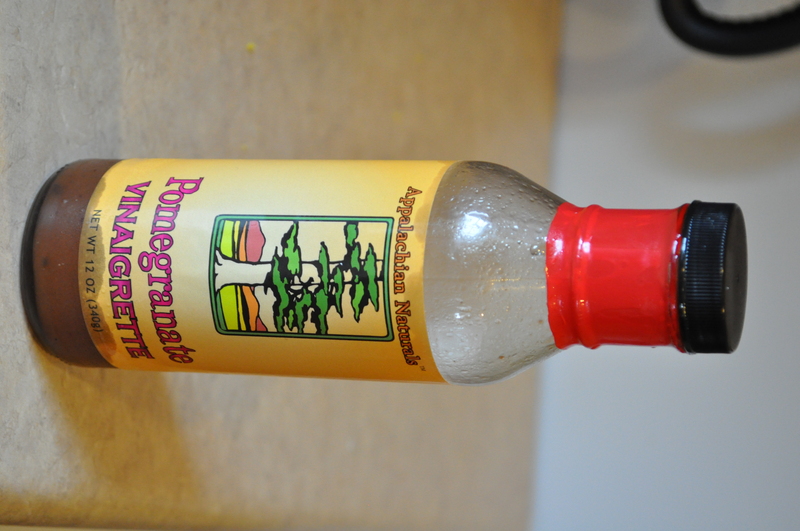 This salad dressing is one of my most favorite things in the world! 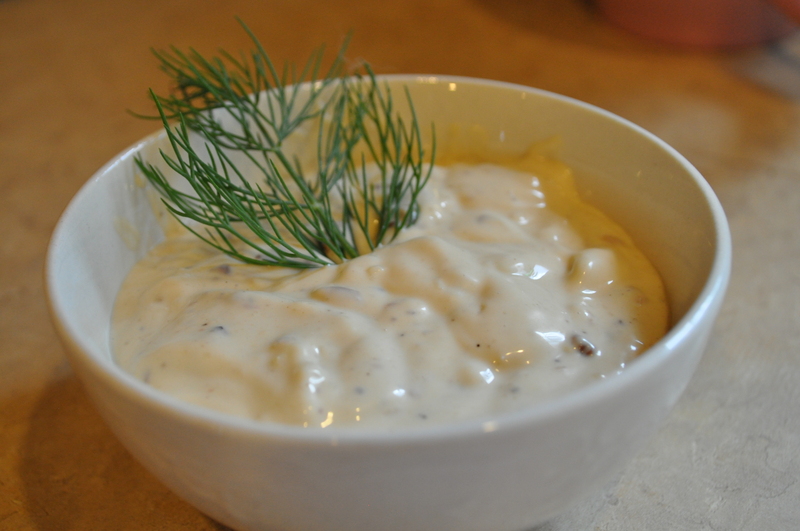 My friend Mary introduced me to this dressing a couple of years ago; she worked part time helping bottle the dressing. I brought some home with me after my visit to Massachusetts (where the dressing is made) and rationed it out over a whole year. A month ago, I discovered that Whole Foods stocks this dressing. Hallelujah! 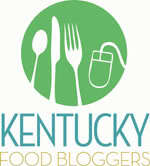 Another pomegranate recipe! I love pomegranate. As a whole fruit, as juice, used in cooking. I don’t think I have every had a pomegranate something that I just don’t like. It is such a unique, robust flavor. 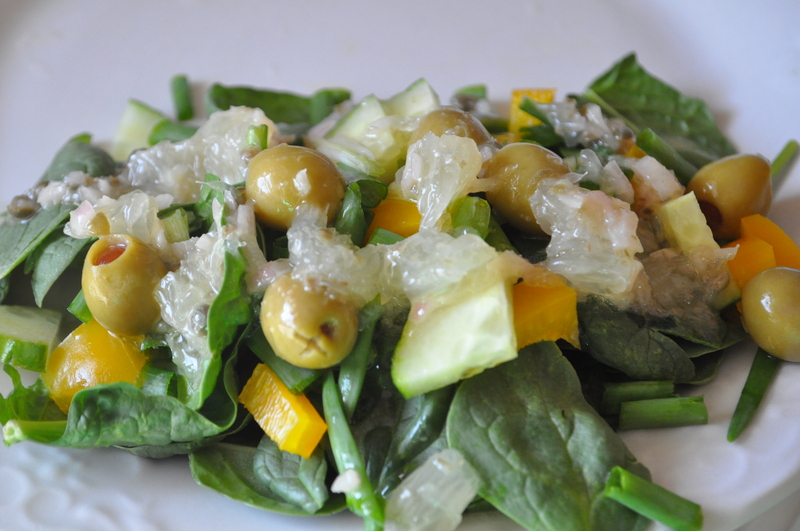 This vinaigrette is very nice with a simple salad. 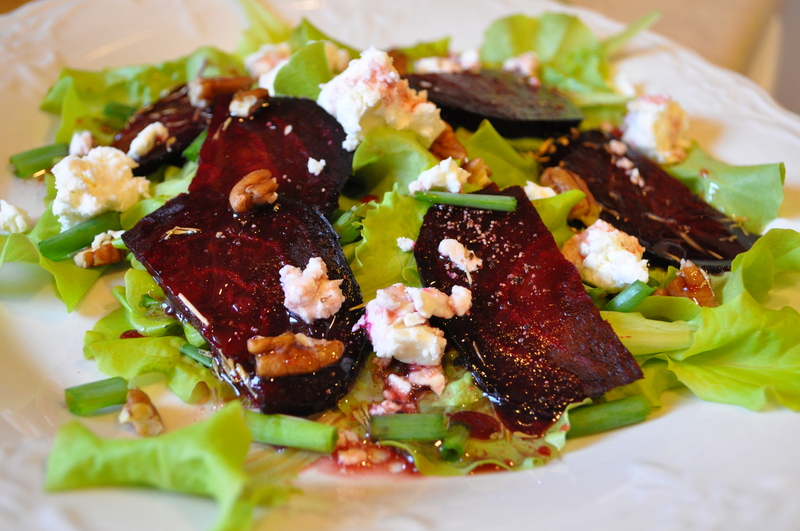 I used my homegrown lettuce, roasted beets, feta cheese, pecans, and green onions to construct my lunch. These flavors pair very well with the fruitiness of the vinaigrette. They compliment, not overwhelm the dressing. A great salad, indeed. Combine the above ingredients with a whisk. Pour over your salad and enjoy! Over a bowl, segment both lemons into another bowl, reserving the membranes left behind. Be sure to remove all the pith and seeds from the segments. Squeeze all the juice left out of the membranes into the bowl. To the juice, add the shallots, mustard capers, salt, sugar and olive oil. Stir to combine. Gently add the lemon segments, tossing to coat. The easier your touch, the larger the segments will remain. Serve over salad of your choice.